The Hyatt Regency (or as Atlantans call it, the Regency Hyatt House) is a fabulous Mid-Century hotel in downtown Atlanta. 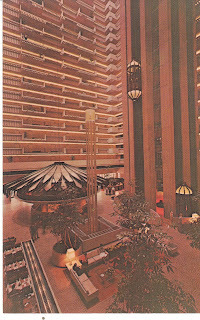 It was designed by architect John Portman, and built in 1967. The top of the hotel had a unique rotating blue restaurant called the Polaris (now closed). It was a unique addition to the Atlanta skyline. You can see a few photos of the Regency Hyatt House at Wikipedia: photos of the Regency Hyatt House in Atlanta. 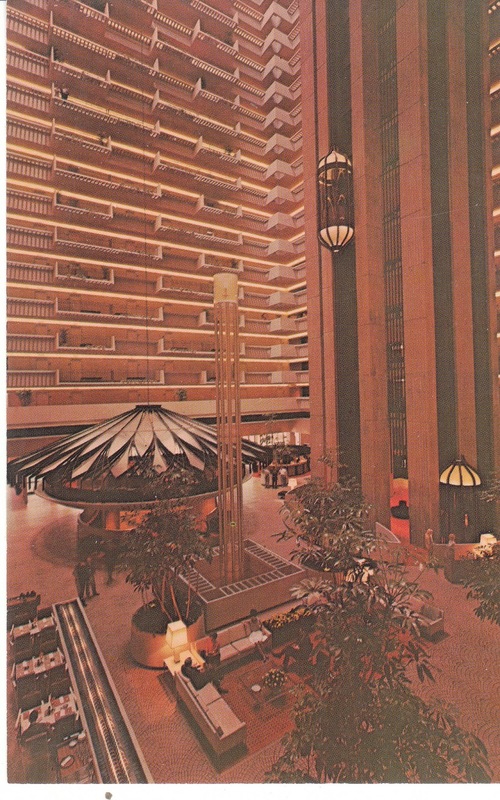 I have several vintage postcards at Birdhouse Books showing the interior of this hotel in the 1960's or 1970's: vintage postcards of the Regency Hyatt House in Atlanta. If you click on the individual cards, you will notice the bubble elevator. When I was a little girl, it was a treat to go shopping downtown at Rich's Department Store or Davison's, another great downtown store. I always wanted to walk through the "hotel district" and ride in the bubble elevators. You will find more vintage photos and links about Atlanta in the 1960's to 1980's on my Pinterest board. You'll also find a fun selection of vintage Atlanta cards, books, and collectibles at Birdhouse Books: Birdhouse Books loves retro Atlanta. Thanks, Pam! I would love to see the Woolworth that is being used as an antique store. I also love to see the neat older buildings being used or repurposed instead of being torn down.